Alabama Hills is set against the background of Mt. Whitney in the High Sierra and features many striking rock formations – some over 60 feet tall. One of the compelling things about the location is that the sky is very dark and it is easy to see the Milky Way when it rises in the sky. Every season has charms in the Alabama Hills from the color of cottonwoods changing in the fall, to the crisp clear nights, and snow capped mountains in the winter, the majestic Milky Way in the summer… No wonder so many car and truck commercials and movies are filmed here. In fact, here is a bank commercial from 1978 featuring “The Duke” (John Wayne). There are many identifiable landmarks and places to meet. Generally we will meet in the Town of Lone Pine, California at the Dow Villa (760) 876-5521 | (800) 824-9317 which is centrally located and travel from there up to 10 miles to the shooting location. Read the directions regarding your specific event to know exactly where to meet. I like the Hourly Weather graphs. The graph for Lone Pine is HERE. 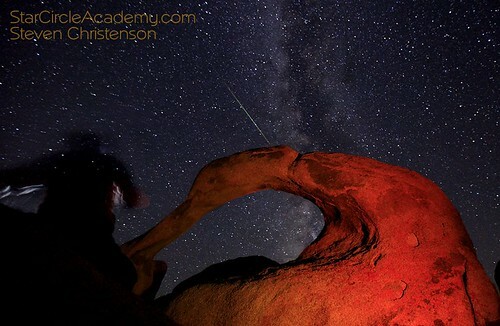 Q: What kind of equipment do I need to have a successful experience shooting photographs (at night) in Alabama Hills? A wide angle lens 35mm or wider and preferably f/5.6 or faster. A shutter release cable. Or better: an Intervalometer that is suitable for your camera. Intervalometers range in price from $30 to $200 depending on the brand of camera and remote. Note that these devices are called a variety of names including multi function remote cord and timer remote and timer remote controller. Several extra memory cards, a memory card reader that you can use with your laptop and at least one spare battery and a battery charger for your camera. Your laptop should also have any software necessary for reading your memory cards and exporting RAW photos as JPEG or TIF files. Photoshop, Picasa3 and Lightroom have this capability if you have a version compatible with your camera. Digital Photo Professional for Canon or Capture NX 2 for Nikon users. A sturdy tripod. Preferably one that allows you to change memory cards and batteries without having to reposition or unmount your camera. Optional: If you have an AC power adaptor or Car power adapter for you camera, bring it. The instructors will bring extra field power. A dim headlamp – the dimmer the better. Why? Because red does less damage to ones night vision – particularly if it is a dimmer deep red. Most red headlamps are not very bright and so cast less light back into others eyes and are less likely to damage your own night vision. Ideally you could operate your camera and navigate in complete darkness. But to strike a balance between needing to see something and fumbling, a red headlamp is your best bet. A dimmable white one (very dim!) is a good second choice. Q: What if I don’t have a laptop computer, can I still attend? A: Certainly. You may miss out on the opportunity to do some of the hands-on training on your own equipment (if included in the event). Q: I’d like to bring a guest/spouse/child? What is the fee? A: If your guest(s) will not be attending lectures or going to the on site shoots there is no additional charge – there is an exception to this policy when the guest is present to assist the photographer for safety. Children (under 13) and pets/comfort animals are not permitted in the meeting locations or at the photography sites for both their safety, and in consideration of the expensive equipment. Q: Are meals or lodging included? Q: I would like to arrive early or stay later than the event. Can I get a special room rate? A: Rooms are available at the prevailing rates which vary seasonally. Q: I may not be able to arrive until after the event starts and/or I may need to leave early. Is that OK? Can I get a reduced rate? A: You will miss some great teaching and shooting opportunities, but it is OK with us. Note, however that if you miss the departure point, you may not be able to find us! Q: Will my cell phone work in Alabama Hills? A: Don’t rely on it. We have found that AT&T service is good in town, but spotty outside of town. Verizon is similar. A: You may arrange to stay where ever you like including at one of the many nearby campgrounds, hotels and motels. We do recommend staying in the specified location for convenience. Q: I have special needs (limited mobility, special diet). Can you accommodate me? A: Perhaps. Please contact us with your needs and we will see if we can work something out. Some of the locations we shoot in do require walking or hiking over uneven terrain at night. There are meals available for vegetarians and a quite reasonable selection of restaurants in Lone Pine. We’ll steer you to the better ones. Q: How much walking/hiking is required? How strenuous? A: Most of the sites we use can literally be approached by car and require a walk over nearly level ground of perhaps 100 yards. Optional sites requires about a 1/2 mile walk over terrain with a narrow use trail and uneven terrain – though it is rather flat. Q: Do I have to sign a waiver to attend? Why? A: Yes. You must agree to sign and date a Waiver of Liability or you cannot be included. We require the waiver because walking in the dark and traveling to and from the shooting sites presents risks. You must be willing to personally accept those risks. Q: Can I pay some way other than PayPal? A: You do not have to create an account to use PayPal, you can pay with your credit card, but the payment will be processed by PayPal. You may send a check in the mail, but we will not hold your spot until the check clears the bank. The address to mail the check to is at the bottom of the Waiver of Liability page. Please be sure to send an email indicating you are sending a check and include your name, postal and email address on the check. Q: What happens if I have to cancel at the last minute? A: We will be reasonably flexible as we know unplanned events arise. However please see the refund/cancellation policy. Q: Who arranges transportation to the photography sites? A: We carpool when and where possible – but if your needs are unique you may want to drive yourself. Q: Will I need an AWD (all wheel drive) or 4WD (four wheel drive) vehicle? A: Usually not. Though a high clearance vehicle is preferred if you’ll be driving. We will be navigating on unpaved, dusty roads that often have ruts and washboards and are often narrow and flanked with shrubbery. If that sounds like a place you don’t want to drive, you can arrange to travel with others. Q: What if the weather is poor – will the event be canceled? A: Of course the weather is not completely predictable! In the event of stormy weather we have some alternatives planned to teach the principles even if the stars do not shine like we would like. Besides stormy weather often presents great opportunities for photography. Q: I would be coming from out of town. Where is the best place to fly to? A: See the further details section for the workshop. Q: What if I have a question that is not addressed here? A: Don’t be shy. Just ask on this page for general questions or on the the event you’re interested in, or send us a private email. Of course what you should bring depends on the season. In the winters it can be cold, even bitterly cold though there is seldom snow on the ground in Lone Pine. In the summer it can be brutally hot during the day (100F degrees, 38C) but even then in the desert climate it cools to as low as 50F (10C) degrees overnight – so no matter what season be prepared for all types of weather. We hold workshops/field events in both the summer and in the fall. Check the time of year of your workshop and prepare accordingly. 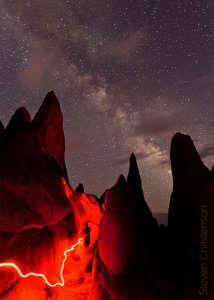 Early October/November nights in Alabama Hills are generally mild but can be cold and windy so you should prepare accordingly. Rain and snow are unusual at ground level but they can occur. During the summer there are sometimes brief but violent storms with high wind. Generally nights are mellow but can be windy, too. Because Alabama Hills is in the rain shadow of Mount Whitney (the tallest mountain in the lower 48 states) there is less precipitation than many surrounding areas. Indeed, Death Valley is not far away. A flashlight, a headlamp – preferably with a red-LED. See the Q&A section for why a red headlamp is recommended. Light (or heavy gloves) are always good to have because the rock is sharp. Bring layered clothing to protect against rain and wind. Lip balm, water. Sunscreen is recommended for daylight shots. Insect repellent is a good idea, but generally there are few insects that will be of any nuisance. Be prepared for temperatures as low as 15 degrees F and windy and you should be fine. Warm layered clothing including a parka, warm sweater or fleece, gloves (light gloves and warm gloves), a warm hat, a balaclava and scarf or similar warm head and neck coverings. A thermos or insulated cup to hold hot or cold beverages. A suitable camera backpack that can hold the items listed above. Rain covering for your camera and backpack and a rain poncho for yourself. Laptop computer with power adapter for processing images. We recommend you load it with Photoshop CC 2018. Distances are quoted in both distance and approximate travel time ONE WAY. Right in town is the Film History Museum. Well worth a look and a short walk from the Dow Villa. Check with them about rates and hours as they change seasonally. Manzanar (near Independence) is only 10 miles/ 14 minutes north. Fascinating (and sad) account of the internment of Japanese Americans during the Second World War. Red Rock Canyon State Park – 90 miles/ 90 minutes south on highway 14. Schulmann and Partriarch Groves (White Mountain): Ancient Bristlecone pines. 78 miles, but allow 2.25 hours. Eureka Dunes (91 miles about 3 hours. very remote, lots of off road driving) but the tallest dunes around. Zabriskie Point (110 miles, 2 hours). Best at sunrise. Kennedy Meadows – 80 miles, 1.5 hours. Undoubtedly the best restaurant is the Alabama Hills Cafe and Bakery. It’s open for breakfast and lunch. The Merry Go Round features Chinese and American food. Steven is snobby about Chinese food and finds this restaurant well above average. The Mount Whitney has a varied menu featuring classic American and Italian food. If you’re in a Pizza or Calzone mood, right across the street from the Dow Villa is the Pizza Factory. … frankly we haven’t had a bad meal anywhere in town, so don’t assume that because we’ve not listed a restaurant it’s not good. Of course you might be the first to stumble into something we haven’t! Lone Pine, California, at the foot of Mount Whitney. It is about an hour south of Bishop, California and 90 minutes away from the entrance to Death Valley. Lone Pine is about a 4 hour drive north from Los Angeles, less than five hours from Las Vegas, and about seven hours from San Jose, California. While Lone Pine has a municipal airport, the nearest major airports are in Bakersfield (about 3 hours) and any of the Los Angeles area airports at about 4 to four and half hours drive. See below for ideas about fly-drive options. For those headed from the San Francisco Bay area, there are two driving options, each about 7 hours and each with great things to see along the way one option is to drive through Yosemite National park and south along 395. Please check the current road conditions through Yosemite as the first major snowfall may close 120 (Tioga) road. The Eastern Route takes you by Mono Lake, June Lakes, Mammoth Lakes, Toms Place, Bishop, Manzanar and Independence while the Western Route follows 5 or 99 to the vicinity of Bakersfield and then you can either follow the Kern River through to Lake Isabella or take a more southern route through Tehachapi then turn North along 14 to take in the striking Red Rock Canyon State Park 24 miles north of Mojave. The best of both worlds is to drive down by the Eastern Route and back north by the Western Route. If Tioga road (120) is closed usually all of the other passes (4, 88 and 108) are also closed but Route 50 is usually open through South Lake Tahoe (or Interstate 80 through Reno). The Western route is seldom if ever affected by weather. From San Diego, it is about 5 hours to Lone Pine via 15 and then 395. An interesting diversion is Searles Valley where the Trona Pinnacles formation can be found. The deviation in the route adds an extra hour or so of driving. From points west of Ontario in the Los Angeles area the preferred route is 5 North to 14, then 395 North to Lone Pine. An interesting stop along the way is Red Rock Canyon State Park. While Lone Pine has its own municipal airport, the nearest major airport is Bakersfield, California, about a 3 hour drive to Lone Pine. Burbank, Ontario and LAX airports are all about a 4 hour drive away and offer rental cars and many flight options. Flying into Las Vegas allows a four-and-a-half hour drive through Death Valley on the way to Lone Pine. Fall (or early spring) are great times to visit Death Valley but we suggest you allow extra time because Death Valley is huge and has many interesting places to visit. Summer is BRUTAL in Death Valley, and we don’t recommend you divert through Death Valley in the summer. However, Las Vegas airfare is often cheaper than the other airport options. We are not responsible for arranging transportation, though we do encourage carpooling, shared expenses and shared driving!